YogaFit. Yoga and Fitness on Sydney's Northern Beaches. Located on the beautiful shores of Sydney's Northern Beaches. Terri's YogaFit offers Yoga and Fitness to soothe the soul, gain flexibility and strengthen the body. Transform as we look from the inside, through breath, presence, movement and stillness. ARISE TO COME INTO BEING - YOGA RETREAT BYRON BAY MARCH 2019 - WHAT BEAUTIFUL ENERGY. 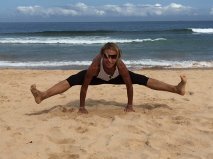 Located on the beautiful shores of Sydney's Northern Beaches, Terri's YogaFit offers Yoga and Fitness to soothe the soul, gain flexibility and strengthen the body. Offering yoga classes or one on one in Vinyasa Flow Yang style (strength and cardio) Yin Yoga (stillness and nurturing aiming for deeper connective tissue) and Yoga Therapy a practice designed for your purpose and body, designed more for one on one. Meditation (concentration/awareness) and Pranayama (breath control) Personal Training is also offered one on one. Why come to my yoga class? I can show you how to move your body with breath, through learnt and proven sequences that engage and strengthen your whole body, to challenge and expose you, to soften and surrender to the present moment! I want to share my passion of yoga and connect with you, so that you can find your path and not fear to walk it. To heal from within and find love deep within your body to love and be loved. Magic happens on your mat, especially when you may feel out of your comfort zone. True self evolves. Through self-observation, understanding, acceptance and the discipline to make changes you can truly grow to find inner peace and love for self. Each yoga class is themed with yoga teachings relevant to one’s life on and off the mat. Focusing throughout the class on breath awareness, flowing vinyasa sequences to strengthen, Yin yoga or Restorative yoga to Calm you and Hatha yoga for alignment exploration. All classes stretch and relax your body with meditation and breathing to calm your nervous system and relax your mind from its constant busyiness. Yoga Therapy designed for you and your purpose to practice within your home or studio, as I guide you with regular sessions until you feel ready to continue the journey on your own.